GeoVapor Series consist of high performance underslab vapor barriers designed to retard moisture migration through concrete slabs-ongrade. This product is made from state-of-the-art polyethylene resins that provide superior physical and performance properties that far exceed ASTM E-1745 (Plastic Water Vapor Retarders Used in Contact with Soil or Granular Fill Under Concrete Slabs) Class A, B and C requirements. 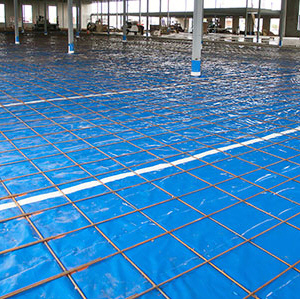 High tensile strength, unequaled puncture resistance, ultra low moisture vapor permeability as well as resistance to decay make GeoVapor one of the most effective underslab vapor barriers on the market today! Available in Blue/Blue 6 mil, Blue/Blue 10 and Blue/Blue 15 mil thicknesses to best meet required performance specifications. Click here for Product Data Sheet.